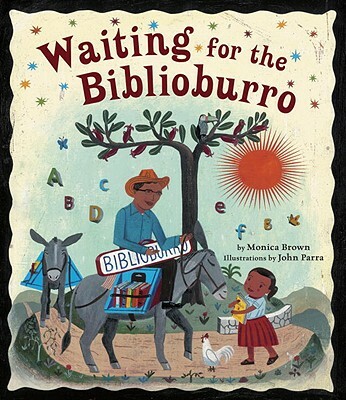 MONICA BROWN's Peruvian-American heritage has inspired in her a desire to share Latino/a stories with children. Her books have garnered starred reviews, The Américas Award, and a Pura Belpré Honor. In addition, she received the prestigious Rockefeller Fellowship on Chicano Cultural Literacy from the Center for Chicano Studies at the University of California. Monica is currently Professor of English at Northern Arizona University in U.S. Latino and Multicultural Literature. JOHN PARRA is an award-winning illustrator, designer, teacher, and fine art painter whose work is avidly collected. John’s books have received starred reviews and have appeared on the Texas 2x2 Reading List. He has received the SCBWI Golden Kite Award for illustration, the 2006 International Latino Book Award for Best Children’s Book Interior Illustrations, and the 2010 Pura Belpré Illustrator Honor Award for Gracias/Thanks, written by Pat Mora. "The pleasure and love of reading are joyfully brought forth in this simple, happily rendered tale." "Parra’s colorful folk-style illustrations of acrylics on board bring Ana’s real and imaginary worlds to life...The book is perfect for read-alouds, with occasional, often onomatopoeic Spanish words such as “quiquiriquí,” “tacatac” and “iii-aah” adding to the fun." "Parra's naïve-styled acrylics brim with scenes of country life. A palette of salmon pinks and turquoise and sky blues, painted on board, give the book a rough-hewn, handmade quality and an innocent, childlike appeal (with her wide face, delicate features, and rouged cheeks, Ana even resembles a porcelain doll). In a metafictional ending, readers will notice that the book Ana hands the bibliotecario upon his return is this very book--fitting, as this truly is Ana's story." “This sample of the impact of traveling librarians on rural children, inspired by a Colombian teacher-librarian, not only celebrates their work but eloquently portrays a matchless way to inspire learning: by feeding the natural hunger for story....Small, brown-faced Ana’s enthusiasm is contagious, and the satisfying denouement, in which she donates her homemade book to the traveling collection, is just right."